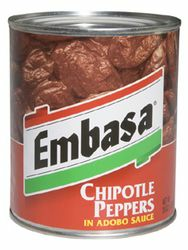 Embasa Chipotle Peppers in Adobo Sauce 26 oz. Smoked red jalapenos peppers in spices, vinegar, tomato sauce and ancho chiles. Great Embasa chipotle peppers! (pronounced "chee-POHT-lay"). We use these chipotles in soups and stews. they add not only fire but great taste to our cooking, The adobo sauce also adds additional flavor.